Their viewership is up more than 40 per cent in the past year, thanks to the Digital Access System. Every time Siddhartha Mehta, a 25-year-old investment banker in Mumbai, goes to New York for work, he buys videos of the latest TV shows, such as Game of Thrones and Homeland. His pet peeve is that Indian English-language entertainment channels are generally a couple of seasons behind. "If Hollywood movies can be released in India at the same time as in the US, why can't the TV channels air the latest seasons of popular television shows," he asks. Nineteen-year-old Amlan Roy, a resident of Hyderabad, resorts to downloading shows from The Pirate Bay - the well known site which facilitates free downloads of copyrighted material - because his analog cable operator does not offer English-language entertainment channels such as Star World or AXN. 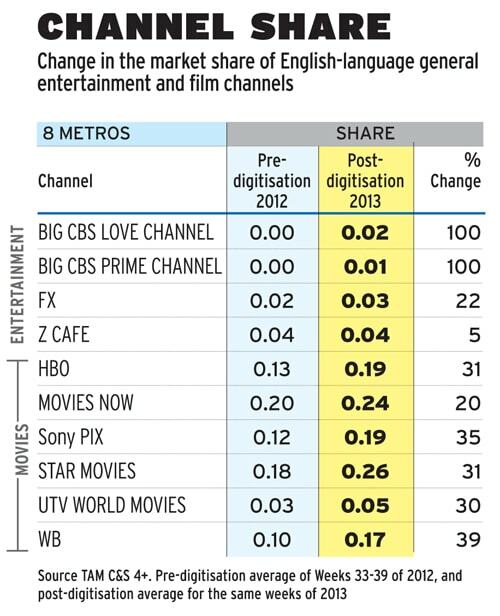 Analog networks can handle only up to 70 channels, so cable operators often stick to Hindi general entertainment and regional-language channels. However, digitisation is making people like Mehta and Roy happier. It gives them access to more than 10 English-language entertainment channels, and the transmission is of higher quality. Digital networks can carry 300 to 1,000 channels. "In the pre-digitisation era, a broadcaster would place an English channel on a prominent band only in five or six top cities," says Kevin Vaz, Business Head (English Channels) at Star India. "In the rest of the country, an English channel would always be placed in one of the lowest bands, where the picture and sound quality are bad. As a result, the rest of India hardly got to view quality English content. Digitisation has broadened the scope significantly." No wonder viewership of English entertainment channels has shot up by 40 per cent in the country since November 1, 2012, when the first phase of digitisation started. 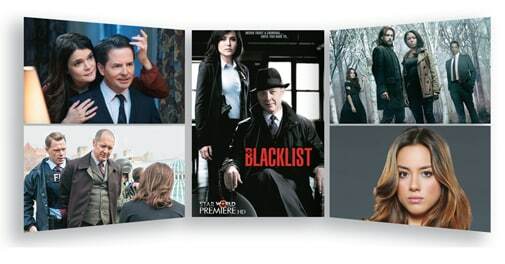 Viewers now not only have more content to choose from, but the launch of premium channels such as HBO Defined, HBO Hitz and Star World Premiere HD gives them access to the current season of popular American sitcoms at almost the same time as when they are aired in the US, in high-definition. Premium content, however, is not free. Star World Premiere costs Rs 60 a month, while HBO Defined and HBO Hitz are available at an inaugural price of Rs 69. Consumers are willing to pay. "I'd rather pay for high-quality content than download pirated content," says Roy. Star India's Vaz says he is confident that if a broadcaster offers a good product, there will be takers. A spokesperson for the Mumbai-based last-mile cable operator CTV agrees that people are willing to pay for content of good quality, and adds: "I have been losing consumers to DTH over the past month, because my network doesn't offer Star World Premiere." The Star channel is currently available only on direct-to-home platforms. Indeed, channels such as Star World Premiere and HBO Hitz are completely subscription-driven, and do not depend on advertising revenue. Broadcasters are confident that subscription-based channels will work even in a market like India, where over 60 per cent of their revenue comes from advertising. Except for India and Pakistan, HBO is subscription-based worldwide, says Monica Tata, Managing Director, HBO India. "We have been able to launch a subscription-based channel in India only because digitisation has enabled us to air good content with HD quality and surround sound. The response to our subscription channels has been phenomenal." Subscriptions would be the way to go for most English entertainment and movie channels, says Mona Jain, CEO of VivaKi Exchange, a media planning and buying agency. "One will see more and more English-language broadcasters premiumising their content and going the subscription way." Despite the leap in viewership, ad rates remain low. A 10-second spot on Star World or Star World Movies - both English-language channels that depend on advertising revenues - is usually in the region of Rs 2,000 to Rs - 2,500, while Star Plus, the group's flagship Hindi general entertainment channel (GEC) commands Rs 1.5 lakh to Rs 2 lakh. VivaKi's Jain says it will take time before advertisers make that leap of faith. "English entertainment channels are a great platform for advertisers to target youth who are difficult find on Hindi GECs," she says. "Advertiser interest in these channels is growing." What is the future of subscription-driven English-language channels in a market that is used to paying a paltry Rs 140 a month to watch a whole host of channels? Saurabh Yagnik, Executive Vice President and Business Head at Sony Pix, says: "Though subscription is the way forward, the revenue model has not been optimised yet. As we keep evolving, we will get critical mass for the audience, and then the model will optimise. Till then, we will have to depend on advertising."